Every desk has a pack of sticky notes and the smart office has holders that keep them clean and from being wrinkled. Our sticky note holder is a perfect gift for schools, businesses, and home decor alike. Add company logos and these make great sales incentive awards. Another good idea is to imprint them with local places of interest for souvenir shops, marketing them as cute mementos of the great attractions in your local area. Always look for ways to tie your goods into imprinted sets: Condé offers a great pencil holder that could be imaged to market as a set with the sticky note holder and desk name plate signage. Carry it further with letter boxes and planters, you could create the ultimate office decor set! 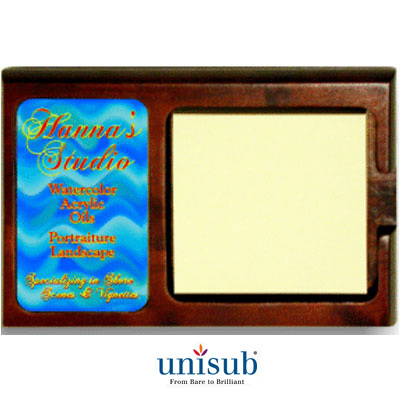 Unisub™ Sticky Note Holder, Mahogany Stained Solid Wood Base Kit, Fits 3-1/4” Post-it® Notes (not included), item does include the Unisub U5733 Sublimation Aluminum Insert (Rounded Corners), and rubber feet. Insert: 2” x 3-1/2”x ¾”. Dimensions: 5.4375" x 3.125" x .25"